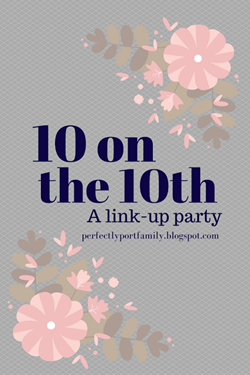 This month’s topic for 10 on the 10th with Perfectly Port is 10 Things You Love About Your House. I decided to modify this topic into 10 Things I Love IN My House! It was kind of like a scavenger hunt, going around and photographing things I love and want to share here today. 1. My entry way. This is where I decorate for each season! I finally changed things up for fall! 2. Gallery walls. I have a few. 3. My Grandparents’ wedding photo, along with my parents’! 4. A shadow box I made for Simon which contains his coming home from the hospital outfit. 5. A window frame that I decorated and hung above our bed. 6. This mirrored tray and jewelry box that was my grandmothers’. 7. My jewelry collection. I made the necklace displays – one from a mug stand and one from a frame, an old sweater, and hooks. 8. My bathroom display cabinet. It used to have a door on it, but I took it off. And now the door hangs on the wall with mason jars attached! 9. This ceramic dog that used to belong to my grandma. Not the one who used to own the mirrored tray, but the one in the wedding photo! The dog’s name is Sam. 10. This framed photograph that I took in 1999 in Egypt. It might be the best photo I ever took and it was way before I had a fancy camera or photo editing software! As far as things I love ABOUT my house…well I like our neighborhood, I like that we have 5 bedrooms and that ours is on the ground floor, I like that all of our bathrooms have showers, I love our dining room, and I love the people who live here! How about you? What do you love in or about your house?